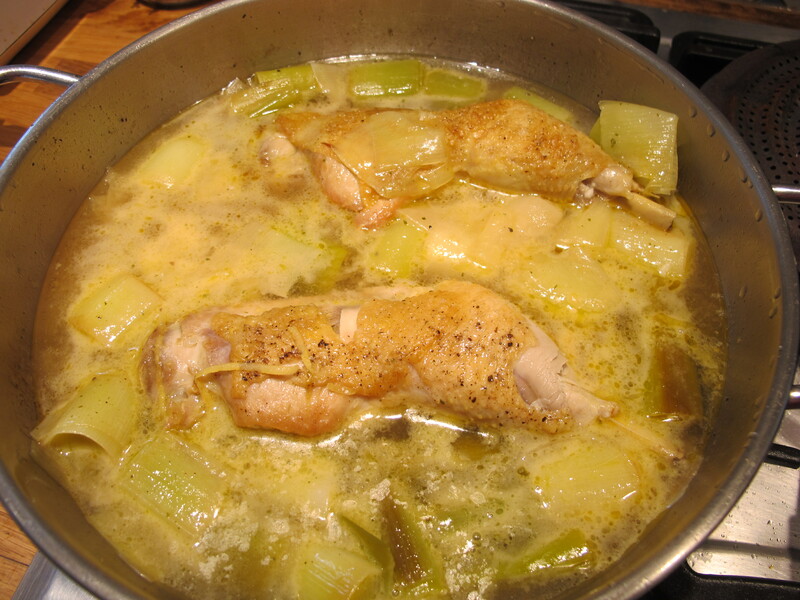 This is a handy lunch or supper dish–for two here; but for four with the simple addition of two extra pieces of chicken and another leek. It’s adapted from a recipe in Nigel Slater’s impressive tome Tender–a tour de force of loving care. In it he tells the story of the creation of the vegetable patch in the back garden of his London home, and what pleasure it gives him. He plants, he tends, he gathers and he cooks. More than just a book of recipes, it’s an enjoyable account of what can be done with a limited space in the heart of a city. 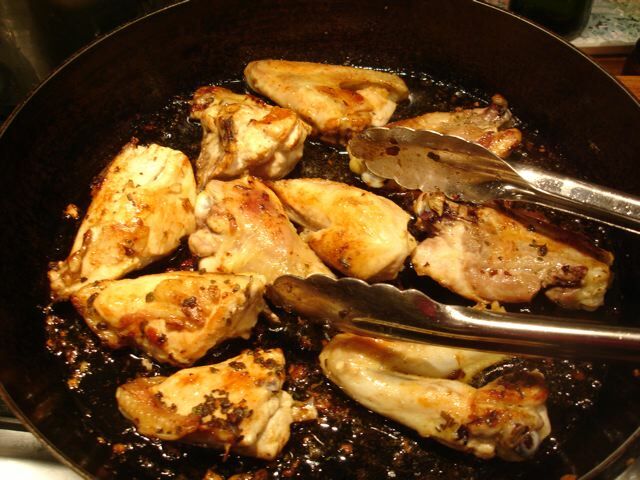 Heat the oil in a pan and slip in the chicken pieces. Gently color them on both sides on a low to medium heat–8 to 10 minutes in all. 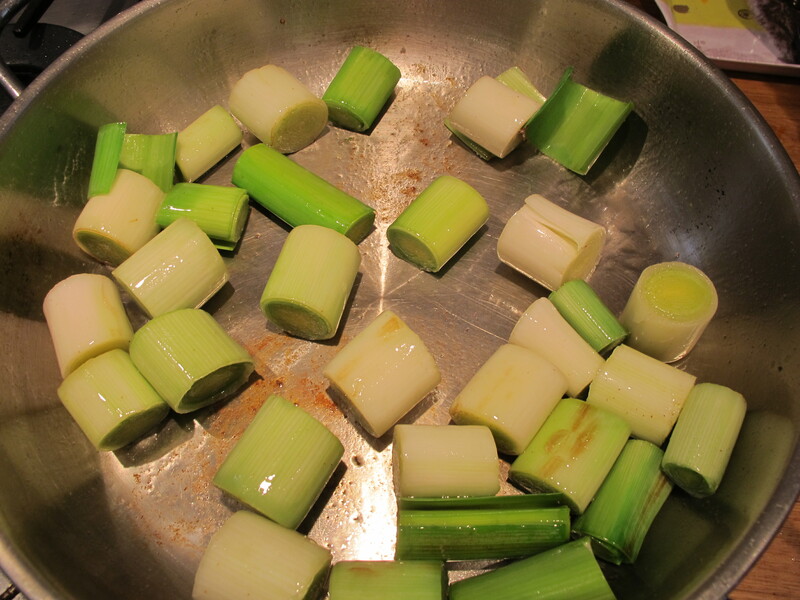 Add the leek stubs to the pan and turn them over in the oil. 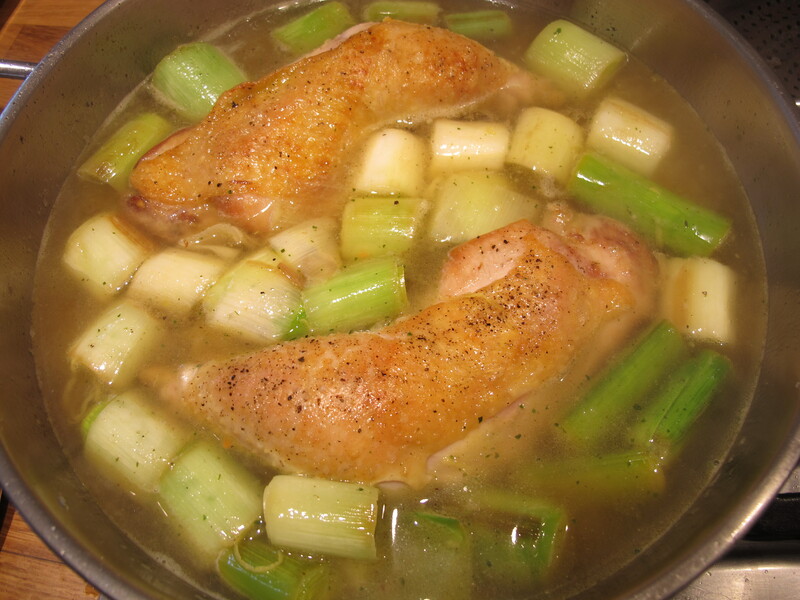 Cover the pan and cook the leeks until they begin to soften–about five minutes. Season the chicken pieces and return them to the pan. 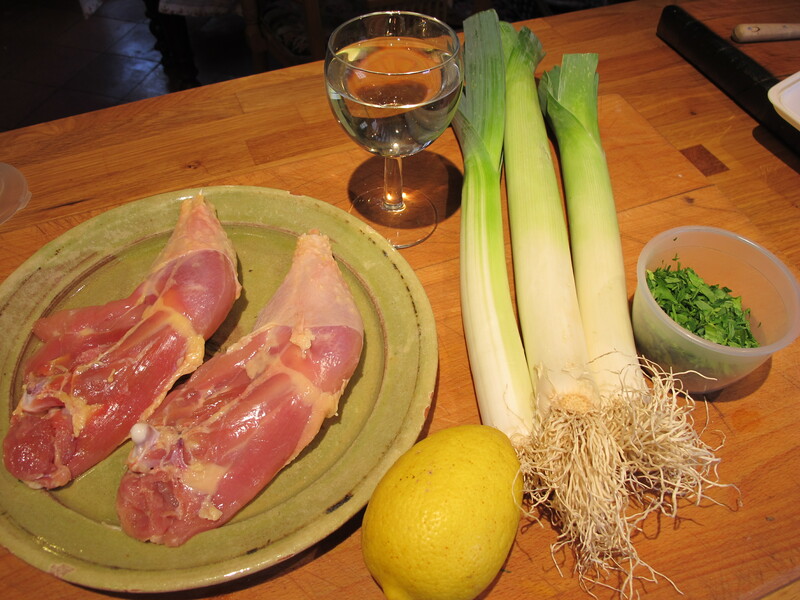 Add the wine, the lemon zest and juice, a tablespoon of parsley and the stock. Bring the pan up to the boil, turn the heat down low and cover the pan. 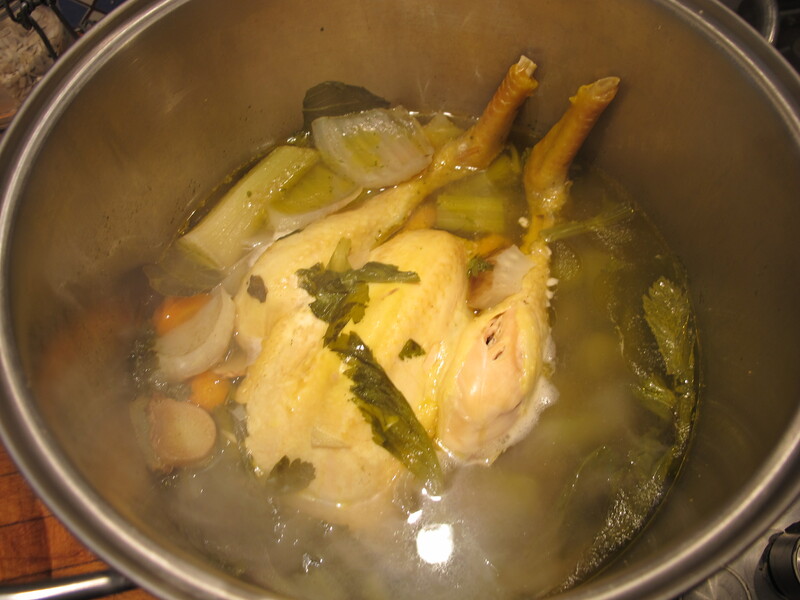 Cook at a simmer until the juices run clear when you pierce a piece of the chicken–about 20 minutes. Check the seasoning and sprinkle over the remaining parsley. “Horses for courses”–chicken for chills! “Please–just some broth today!” was the request this morning from the sick bed. Poor Meredith has been fighting the lurgy since Christmas Day. Not a person to give in lightly to a tickle in the throat she has been up and back to bed all week. We were bucked up last night by watching the original Shrek film, which I hadn’t seen. It is high in the chuckle factor and almost as good a tonic as a bowl of chicken soup. But this morning after a troublesome night it has to be the real thing–so here goes! the kitchen sink (only kidding!). I bring these slowly up to the simmer–while feeding Beau a little cat milk and reassuring the patient that broth will be ready at the end of a brief snooze–cover it and leave it to bubble for an hour and a half. cook on until they soften and serve them with the broth. Now, not meaning any disrespect to “grandma’s” traditional cure-all remedy–especially not as in a few days I shall reach the traditional “alloted span” and so must watch my tongue–I always find this broth/soup less than more-ish. So what am I doing wrong? 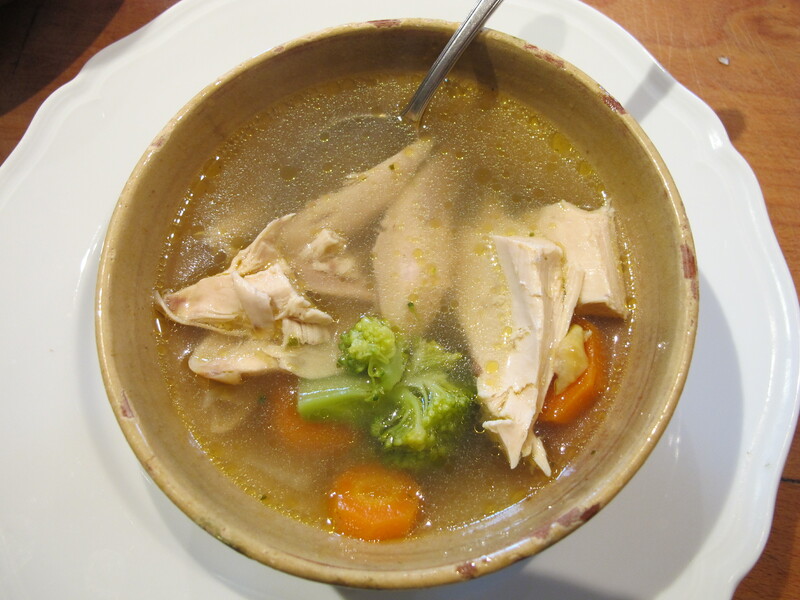 I notice that in several internet versions tinned chicken broth is used. As broth is staying on the menu for the next few days–I’m in the market for ideas! Nevertheless the patient said she was happy with the outcome, but advised that the broth be refridgerated overnight for the fat to rise, be skimmed off and the soup to be reheated. 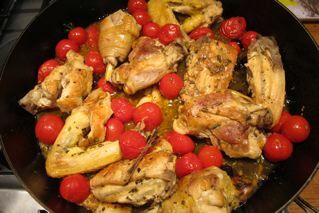 A bowl of cherry tomatoes waiting their turn, reminded me of this delicious Marcella Hazan recipe–a different summer way with chicken. The sweetness of the cherry toms is cut by the little black olives from Nice. Meredith bought some last week. And rosemary is cascading in the garden. 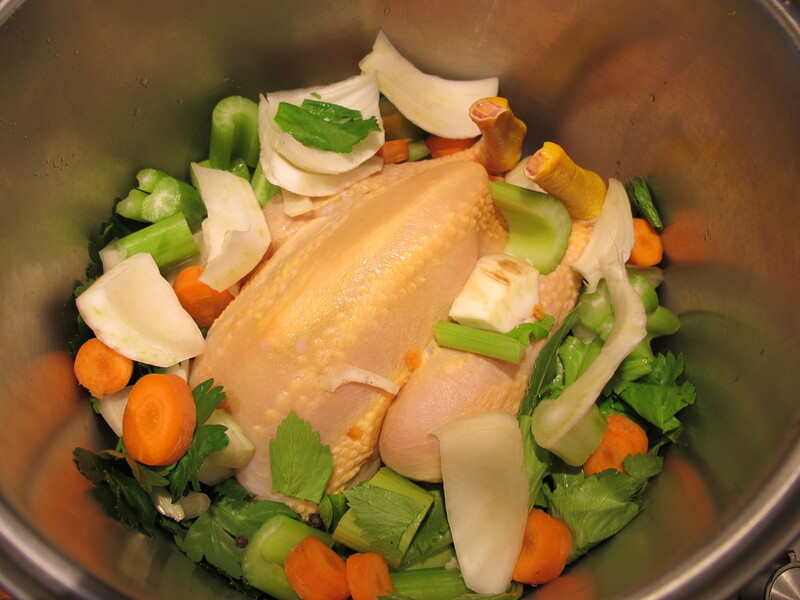 Trim the excess fat and some of the loose skin from the chicken–tidying it up. Heat the oil in a large sauté pan with a lid. Add the rosemary and garlic. 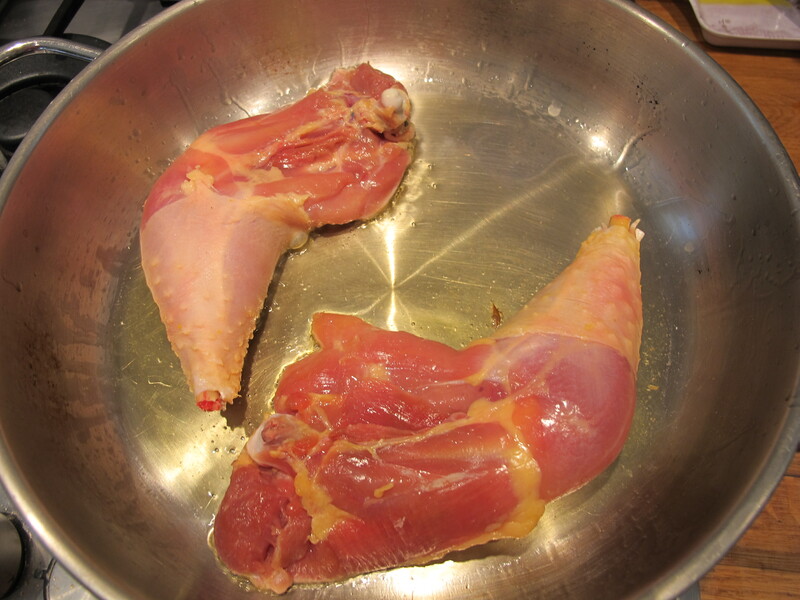 Put in the chicken pieces skin side down and sauté them over a medium high heat. Nudge them with a spoon after 2 to 3 of minutes–when they move easily without sticking to the pan look to see if they’ve nicely browned. At that point, turn them over and repeat on the reverse side. When you have a pan of golden chicken pieces season them generously and add the wine. Let it bubble a little–then cover the pan and cook the chicken for about 30 minutes on a low heat–turning the pieces from time to time to keep them moist. Add a tablespoon or two of water if needed. 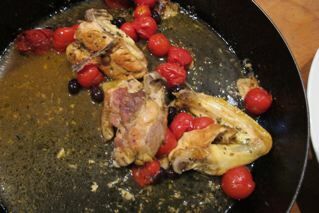 Add the tomatoes and olives and cover the pan again. Cook until the skin of the tomatoes show signs of splitting. 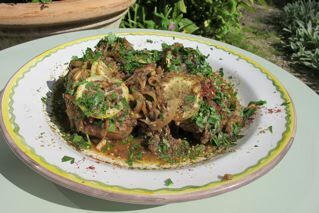 I found this recipe in Anna del Conte’s Classic Food of Northern Italy. 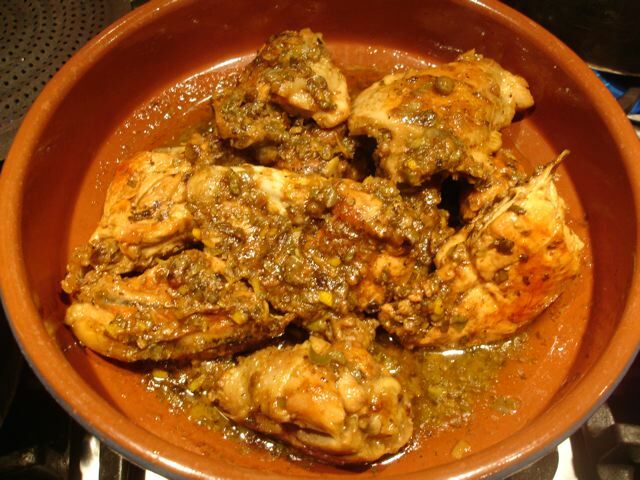 It originates from an Umbrian cook, Zia Lidoria, and though in her version is for rabbit, it works well for chicken. [see below one way to cut up a chicken]. 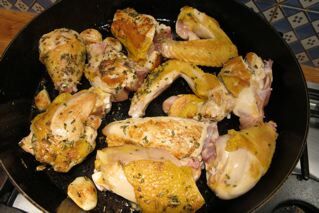 The long initial browning of the chicken is a little scary; the pieces seem to be shrinking alarmingly, but they come back to life when liquid is added. Chop the garlic and sage together. Fry the mixture gently until the garlic begins to colour—a couple of minutes. 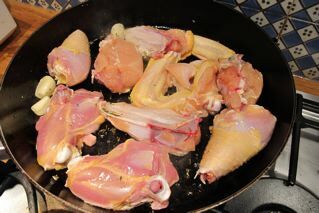 Add the chicken pieces to the pan and turn them over well in the garlic, sage and oil mixture. This is the long bit and will take about 45 minutes! Keeping the heat low, turn the pieces every few minutes as they begin to take on a good colour. Hold your nerve and when they are nicely browned add the vinegar and hot water. 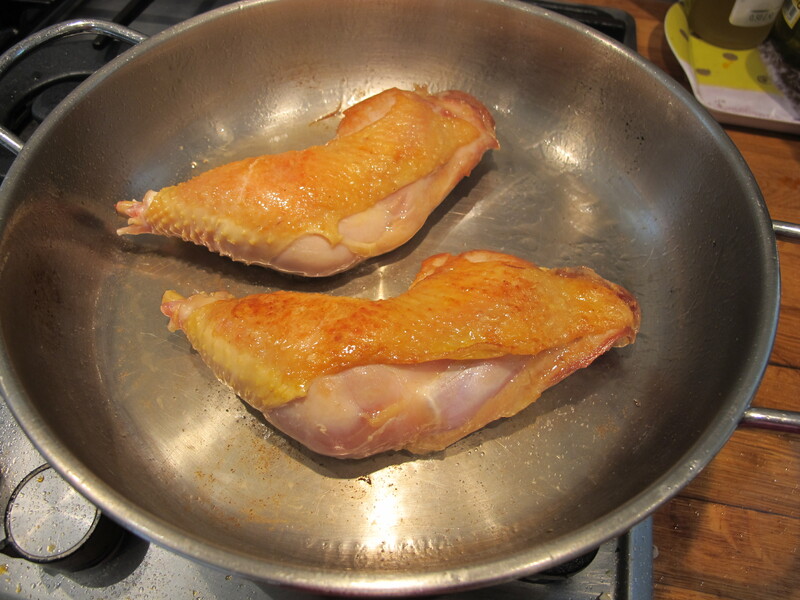 Turn the chicken in the liquid, season well with salt and pepper and cover the pan. Cook on a low heat for a further 40 minutes. 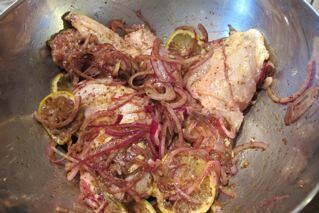 While the chicken cooks on, chop the lemon rind, the capers and the anchovies finely together, then sprinkle in the flour, stirring it in well. 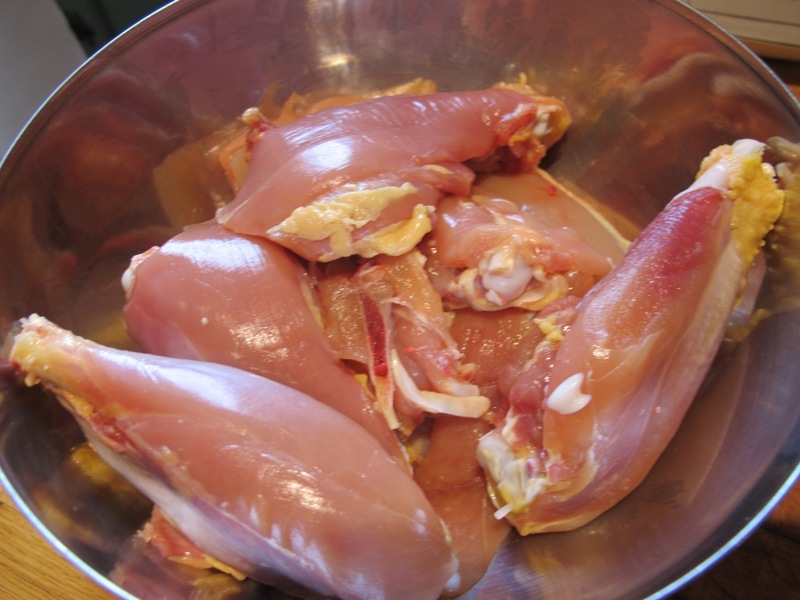 When it’s time, remove the chicken pieces and keep them warm in a heated serving bowl, covered with a lid or foil. Try the sauce in the pan and if necessary reduce it a little to concentrate the taste. Stir in the lemon rind mix and cook for a minute. 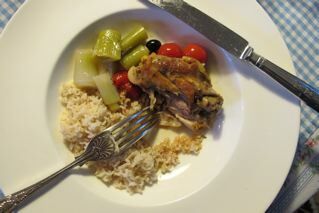 Pour the sauce over the chicken and serve with brown basmati rice or chickpea mash. We had some broccoli with it last night. Mark Bitman of the New York Times bones a chicken in this video and explains clearly how to do it and why there are good reasons to try. 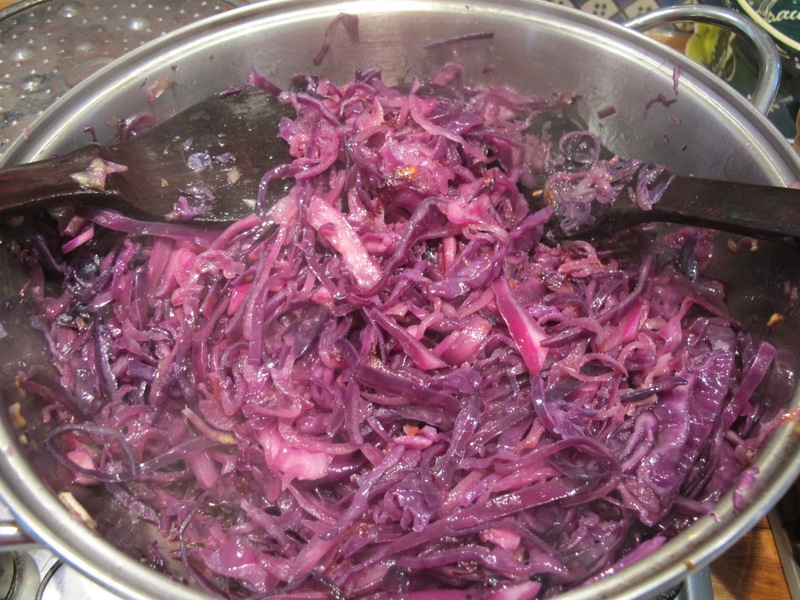 Red cabbage is a member of the strangely named cruciferous family of vegetables (the four petals of their flowers are in the shape of a cross), together with broccoli, cauliflower, brussels sprouts, kale, and bok choy. These are super vegetables with many health benefits claimed for them. Adapted from a Marcella Hazan recipe it has the advantage of being an all-in-one dish. 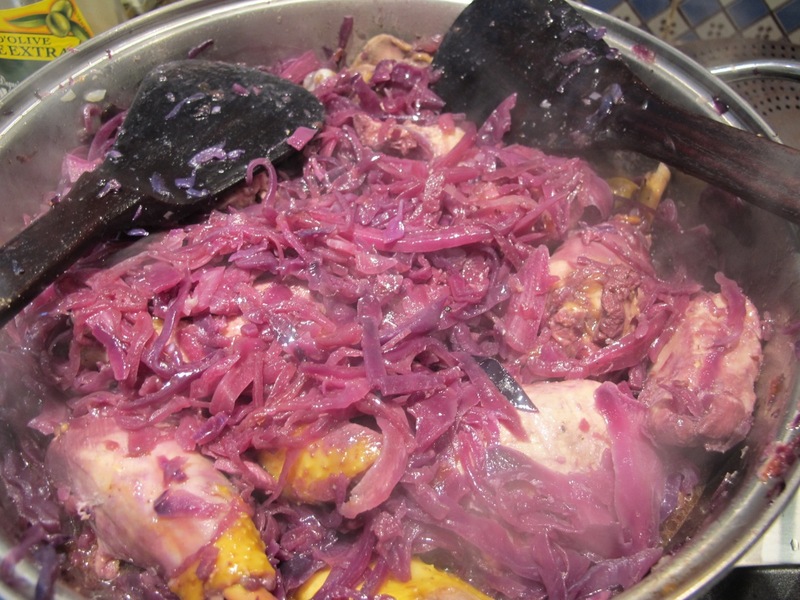 The chicken stays beautifully moist under its warm overcoat of collapsed cabbage. Choose a casserole or terracotta pot large enough to hold the chicken pieces in one layer. 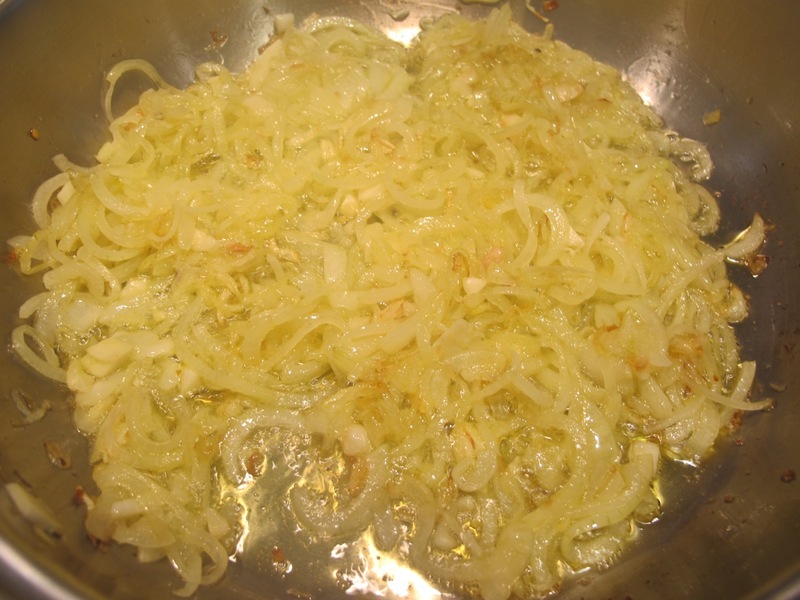 Soften the onion and garlic in the oil until the garlic begins to colour–about 10 minutes. 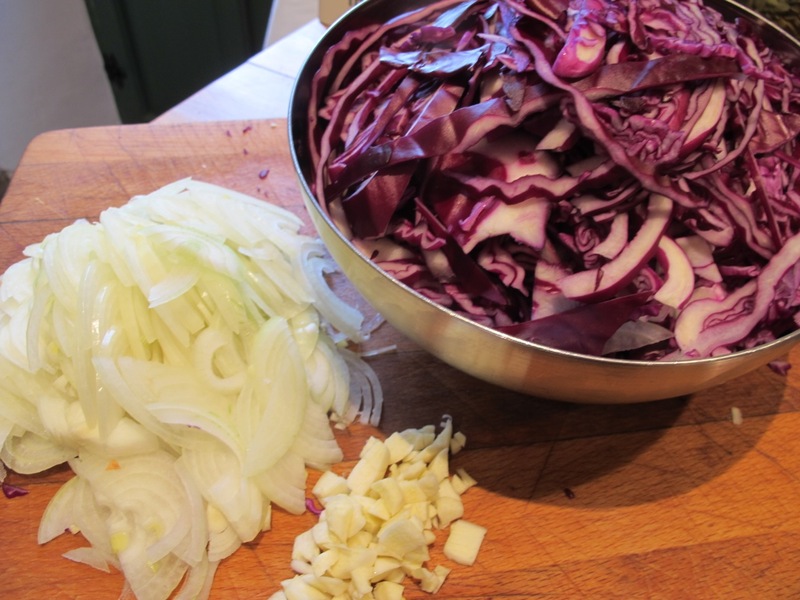 Add the cabbage and coat it well with the oily onion and garlic mix. Cook for 15 minutes, turning it over from time to time. Season the cabbage well, then bury the chicken pieces underneath it. Pour over the red wine and cover the pot. Cook for 40–45 minutes, turning the contents over from time to time and taking care it doesn’t burn.